PSN Flash Sale "99 Cent games and less"
Remember when we said that South Park: The Stick of Truth is priced for $4.99 two days ago? 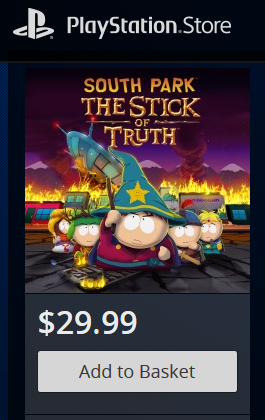 A few days ago “South Park: The Stick of Truth” was priced for $4.99 on the US PlayStation Store, a price almost too good to be true. If you were lucky enough to hear about this (We did post this news on our Facebook page) you probably snagged it for that price. Honestly, $5 is a bargain considering the game goes for $20 in retail stores, the game has a 85 metacritic score, and a lot of companies gave it great reviews. Update: Due to an error, South Park: The Stick of Truth was listed on the US PS Store at an incorrect price. We apologize for the error. So it was a pricing error! Well like we said on our Facebook page “..might be too good to be true..” Now the price is back up to $29.99. Were you one of the lucky people who bought it for the dirt cheap price, or were you just a little too late? Don’t forget to follow us on Facebook and twitter for more news and updates.